The focus of this three-day watercolor workshop is with learning pouring techniques with watercolor, using a limited palette of color. Finishing tips will be learned to make the subject and background unified. Each artist will work on their own subject and design, whether it be a portrait, floral, abstract, etc., and they will gain new insights and ideas for completing their painting with dynamic impact. 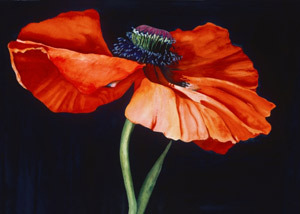 Sarah B. Hansen’s main objective in painting is to convey a connection to nature through its most elemental shapes. Using suggested patterns from an underlying gesso texture, she captures this feeling by establishing strong color schemes, dynamic compositions, and gestural strokes using various tools. During the course of this workshop, Sarah will discuss the value of compositions, structure of natural forms, and development of color schemes. You will learn how to “see” landscape forms as masses of interlocking shapes and values, thus creating an abstract, yet recognizable landscape painting. She will walk you through the challenging aspects of using watercolor and gouache paint; applying color without disturbing previous layers, understanding water to paint ratio, blending, and incorporating mixed media. "Water Color Painting with Terry Armstrong"
Watercolorist Terry Armstrong will share some of his techniques that blend realism and abstract painting. In this experience, you will paint a purple trillium using watercolors. For beginners as well as experienced painters. All participants under the age of 16 need to be accompanied by an adult. The basis of this 5-day workshop will be sketching and painting on location around Santa Fe. Basic drawing and quick, intuitive watercolor will be taught, and will become the heart of our Santa Fe journals. Using the city’s Mexican, Indian and Spanish influences, we’ll draw flowers, buildings, food, farmers market treasures, and anything that we find that gives us a sense of place. We’ll also carve original stamps, create mono-prints, and add collage to our journals. Our handmade sketchbooks will be filled to the brim with color, images and memories of our week in historic Santa Fe. "Discover the Poetry--Atmospheric Painting in Watercolor"
Have you ever wondered how to get mystery into your paintings? Then this is the workshop for you! Conveying atmosphere is Frank's specialty! 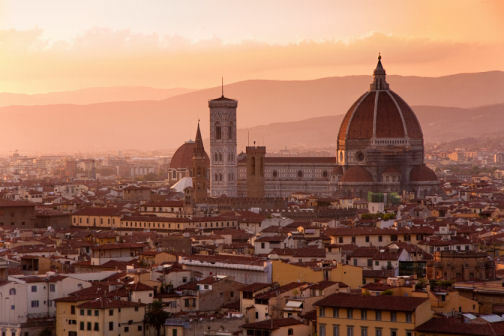 In this workshop participants will learn about editing the scene, composition and design principles, color mixing, the importance of edges, figures and cars in streets, and many other tips. "Supplies for Art Aren't Always Art Supplies"
Discover a different approach to water media in this four-day workshop that focuses on creativity and resourcefulness. Combine traditional art supplies with everyday tools to create unique effects and, ultimately, a distinguishable visual style. Each morning and afternoon will begin with a demonstration of a specific technique, including masking and resists, glazing and washing, creating textures, color mixing, and rendering light and shadow. Geoffrey’s take on drawing, composition, and studio setup will also be addressed. The rest of each day will be dedicated to working on exercises and paintings with Geoffrey available for individualized feedback. Whether you’re an advanced beginner or master, realist or abstract painter, you will benefit from these new techniques and materials. "Watercolor Workshop: Discover the Visual Language of Painting"
As a teacher, my goal is to see the lightbulbs come on when students realize that painting isn’t as mysterious as it seems. Of course, it’s still challenging—which is part of the fun—but the visual language is something that I believe we all can learn. In my workshops, I try to teach shortcuts that allow students to make leaps in their understanding of this visual language and how to avoid many of the common pitfalls of painting, such as inaccurate perspective, mixing colors poorly, and getting restrained by the details of a scene. With the big shapes planned and an accurate drawing established, it’s easier to loosen up and enjoy fluid washes, expressive brushwork, and bold color. "Design & Texture in Watercolor"
Mary invites each painter to come to this workshop open to the spontaneous nature of watercolor. Allow the playful elements of this medium to show up in your work, enjoy the process of learning and leave judgment behind. Marquiss teaches watercolor, collage and design classes with an emphasis on individual style. 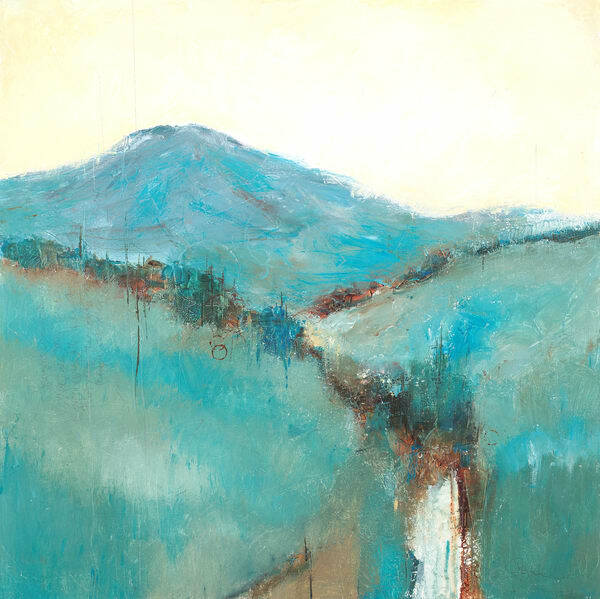 She has received numerous awards from the Oregon Watercolor Society and was a Signature Artist for the Deschutes Children's Foundation in Bend. Marquiss was the Artist in Residence at High Lakes Elementary School for three years and a founding member of the Tumalo Art Gallery in Bend, Oregon. She holds a Bachelor of Science degree from the University of Oregon. 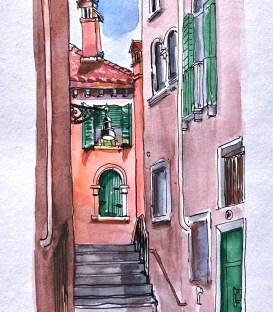 "Slow Travel Using the Creative Process"
Discover how quick studies made using basic drawing and watercolor supplies to record your travels, both near and far, can enrich your studio practice. Explore this two-part process by creating small works that document the places and moments around you before returning to the studio to reinterpret and expand on observations through larger, more finished pieces. 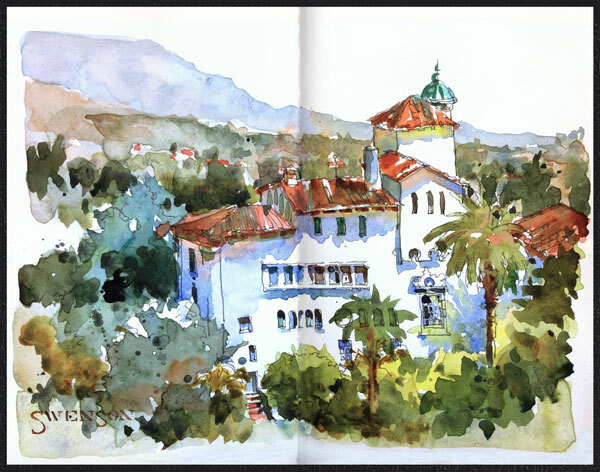 The workshop will begin with an overview of watercolor painting, Brian will share the rich history of using the medium to record travel, as well as best practices for small, quick studies. Beginning students will be introduced to the process and tools of watercolor, while more advanced students will head out into the Door County landscape to create their first works in the “travel spirit”. "Painting in Black and White"
Explore dramatic possibilities in your paintings with a limited palette of black and white. Using the concept of Notan, a balance of dark and light, this workshop will refine your ability to create illusionistic space in any composition through the relationships of figure and ground and transparency and opacity. Working from still life setups, personal photo references of the landscape, and experimental and abstract prompts, you will work through a series of small exercises and paintings. The importance of value and its ability to create depth will be emphasized throughout as you hone your skills in observing and translating value to canvas. The workshop will be comprised of discussions, demonstrations, and group critiques led by Shannon. Open to all levels. Imagine the combination of relief block prints and watercolor. Relief block prints hold a huge realm of possibilities. You can repeat the image to create wonderful additions for cards or works on paper. Learn to design and carve images with little effort on soft rubber material. These designs will build detail and decorative lines for our watercolor painting. Adding watercolor to block prints is a form of instant gratification. Bright colors, lines, and shapes just pop immediately on the surface with little effort. No worries about your drawing skill level – tracing paper will be available! Indulge yourself for a day of creativity with paint, print, and line. "Journaling with Pens and Watercolor"
Pens with watercolor are a very useful combo for journaling on location and just about anywhere! We’ll work with an assortment of water soluble and waterproof pens to create textures, values, and compositions in journals. This will be the foundation for color transparencies. Learn how to paint watercolor layers and fused colors with intensity. This is your chance to play with shape making and combine images in an artful way on paper. Paint freely while dropping in color onto the wet paper surface. And no worries if you’ve never painted or drawn before! I’ll go over the basics and there will be images available to work from or bring some images of your own. In this workshop, teens will learn the process of illustrating a sequential story from writing, layout, and sketching to the final finished pages. Students will design and roughly sketch a multiple-page story of their own creation with illustrations in the media of their choice. Watercolor, colored ink, markers, pens, and colored pencil techniques will be taught. "Painting with Watercolor on Canvas"
This is a workshop designed for artists with intermediate through advanced watercolor experience, and other painters who are interested in learning how to work with watercolor on canvas. You’ll learn the basics and beyond of the range of approaches for effectively using watercolor on Aquabord, watercolor canvas, and other nonporous surfaces in a group class setting. This unique workshop experience will encourage expressive experimentation in this relatively new approach to watercolor on nonabsorbent substrates. It will provide an opportunity for artists to learn new and experimental approaches to a favorite medium. Learn how to capture the glow of watercolor with the convenience of canvas. You can stop framing your watercolors under glass! ”When the breeze blows prayer flags, harmony, happiness, and good fortune are spread among all living beings.” With Jane Everhart’s guidance, we’ll practice traditional Chinese characters, such as moon, tree, land, sky, flower, and wind using traditional Sumi materials. This introduction will prompt our thinking about abbreviated ideas and images for garden banners. We’ll take a Nature walk around MoonTree to look for color and gather natural materials. Then we’ll translate our impressions into images on muslin. The banners you create will dance and interact with the breezes, the wind, or the stillness near your garden or patio. Wear comfortable clothes and walking shoes. All participants under the age of 16 need to be accompanied by an adult. Please bring a lunch. In this fun and fresh water media workshop, you'll learn how to go "beyond" plain watercolor in a fun and relaxed environment while learning to incorporate some new ideas into your tried-and-true techniques. Expand your horizons as you transport your landscapes, portraits, animals - or anything you want to paint - into even more exciting and relevant works of art. Ward will be teaching his revolutionary painting techniques, using several different kinds of water media including crystal powdered paint, iridescent paint and more. These techniques are featured in his popular DVD/Video series "Brusho and Beyond." Students will get lots of one-on-one instruction. Ward will encourage you to paint and experiment with the different media as little or as much as you like. "A Lively Partnership: Artist and Watercolor"
Painting in watercolor is a partnership between the artist and the medium. This workshop will help you to become comfortable with the medium that is best known for its lively spontaneity. Create fresh, dynamic paintings as you learn how to give up control and allow watercolor to be its best self – fluid and loose. Dan will demonstrate how to take a big brush approach to painting and leave the details behind, as well as key techniques of the medium and lesser known, unique methods. Many photo references will be provided, although you are very welcome to bring your own. Plenty of individual guidance will be provided, as well as a casual group critique to close the workshop. The Northwoods of Wisconsin is a painter’s paradise. Explore the beauty of nature as you conquer the medium of transparent watercolor and gain a deeper understanding of its unique properties, techniques, and tools. Step-by-step instruction will lead you through the creation of a series of paintings. How to block in a painting, interpret color, value, and temperatures, use different watercolor-specific processes, and create sound compositions will be emphasized. Dale will provide individualized feedback throughout each exercise and painting. Photo references of various types of landscapes will be supplied by the instructor. "An Introduction to Gouache: The Painting Medium You Didn't Know You Needed"
Discover the unique characteristics of gouache and how to use it with confidence in the creation of studies and finished works. The workshop will begin with an introduction to the medium, including the properties of gouache and the tools and techniques specific to it. The second day will focus on using gouache as a tool for studies, while the remainder of the workshop will be dedicated to working on a series of paintings. The school’s surroundings will be used as inspiration for assignments. Beginners getting their start and experienced painters interested in learning about this medium are welcome. "Using Gouache Color Studies to Improve Your Paintings"
Designed for experienced painters, this workshop will focus on the preliminary planning stages of the painting process. Using gouache, a quick-drying, opaque medium, create color and composition studies to proceed with more confidence and, ultimately, strengthen your final paintings. Demonstrations and discussions will provide you with an overview of the medium and its unique characteristics, while hands-on lessons in color interaction will help you look at your existing and future work with a more analytical eye. Working from photo references, you will create multiple color and value studies for a single composition and complete studies with flat patches of color to explore abstract structural concepts without worrying about the details. This process allows you to explore several options relatively quickly. "Be Brave and Have Fun with Watercolour"
In this workshop, students will work with Herman to articulate their own vision and particular challenges. The intention of this class is to meet each individual exactly where they are and to support them in the production of work in the classroom that expands their practice in a personal way. The format will lean heavily on individual instruction and will also include lecture and discussion and demonstrations of particular techniques. A step-by-step process will begin with a fast foundation painting and will end with final approach options that are easy to learn and thought provoking. We will be exploring landscapes, seascapes and streetscapes, focusing on various techniques. "Creating Atmosphere in Watercolor Landscapes"
Join Judy Mudd in this 4-day workshop where students will learn how to add a variety of atmospheres to city, land and seascape scenes painted in watercolor. The workshop will focus on developing a vision, simplifying and expanding the various parts of a scene, and learning watercolor techniques used to create mood including color choices, values and edges. Judy's relaxed follow-the-leader teaching style assists experienced beginners to advanced students further develop their skill in the watercolor process. Each day will include discussion of the approach, painting demonstrations, and individual student attention. Classes are relaxed and informal so come and have fun! Visit JudyMudd.com for additional information. "Be Brave and Have Fun"
Unearth fresh and honest art inside yourself and learn to capture it with paint. Herman will teach you to find originality in your own work. Get started with new ideas in a way that is fun and fast. You will learn about color mixing, glazes, composition, drying time, thickness and edges to create an impressionist painting you never thought possible with watercolor. Expect to be challenged to be brave, and to have fun! Herman's works are featured in the books Australian Impressionists and Realist Artists, 120 years of Watercolourist, Artists and Galleries of Australia and New Zealand, and Profile on Contemporary Watercolours. Learn everything you need to build a strong foundation for getting started in watercolor. Receive detailed information on paper, paint, and brushes explained clearly and demonstrated with helpful visual aids. Practice mixing colors; learn how to do basic washes; and find out about special techniques unique to watercolor. Understanding color is essential to creating work that captivates the eye and evokes certain moods or emotions. Through a series of fun exercises you will learn to understand tints, shades, and tone, the color wheel, complementary colors, warm and cool colors, and color schemes. You will make useful charts and swatches that can be used for future reference. Whether you are just starting out or have some experience with watercolor, this class will help you masterfully mix color, no matter what your medium or level of experience. "Art Journaling: A Creative Key!" Artists and illustrators use sketchbook/art journals every day, and in a variety of ways in order to increase both their creative flow and skills, and for pure enjoyment! This class explores fun methods to create and use sketchbook journaling to build your artistic confidence and excitement. Let this class begin your lifelong adventure into creativity that builds each day! This Class is for: Anyone who wants to explore a multitude of ways to use a sketch journal; Teachers who want to give their students exciting methods toward more creativity; Anyone who wants to explore and expand their imaginative life and enjoy stress-free creating. "Creating Illuminated Letters and Decorative Borders!" In this fun class you'll learn valuable methods to create uniquely illuminated initial letters, decorative borders, and fanciful marginalia - similar to illuminated medieval manuscripts! These exciting techniques can be used in designing your own paper products - greeting cards, bookmarks, postcards, scrap book pages, book illustrations, etc. The applications are endless! In addition, you'll learn valuable approaches to color, so that your designs and artworks will be highly attractive and effective. This class is for: Anyone who wants to create beautifully illustrated letters and borders. "Andy Evansen: Painting Bolder Watercolors"
Create beautiful, impressionistic watercolor paintings using Andy Evansen's popular techniques. Class level is intermediate to advanced though beginners are welcome and encouraged to contact Andy for information about attending. Enjoy the beauty of Lake Superior, healthy, locally-sourced meals and retreat amenities, all in peaceful surroundings in the woods and on the water. Lodging packages available. "Sketchbook to Studio. Recording Your Travels at a Higher Level"
Few things are more suited for travel than a sketchbook, pencil, and a small watercolor palette. In addition to traditional plein air work, Iain will focus on strengthening your skills using these tools to record your life through sketching in watercolor. The sounds, smells, sights, and people you come across will remain fresh in your mind as you look over the work you have done on site. There is no better way to relive your memories than a well used sketchbook. Iain Stewart is a signature member of the National Watercolor Society. Technique is everything and Michael Reardon will help you explore many ways to strengthen your skills in landscape and cityscape watercolor painting. You will learn how to create a strong composition, use value to invoke a sense of light and manipulate color for a full expressive effect. Join us for this 4-day workshop and go home with an abundance of techniques to use the rest of your life. Michael is the Author of Painting Light and Color in Landscapes and Cityscapes, from North Light Books and has three instructional DVD’s. Learn to play, and have fun while doing the wonderful ‘work’ of art with internationally celebrated watercolorist, Stella Canfield! Stella will help you free yourself of the fear and judgment that so often prevent us from doing art. You will learn to relax and paint with your heart while exploring design, shapes, color, value and have fun doing it! You will feel immensely inspired and free of the myth-inflicted fear of watercolor. Stella will guide students working from their own photographs or sketches. Each morning starts with Stella doing a demo, followed by one-on-one instruction with each student throughout the day, leaving enough time to finish a painting a day! Success in watercolor has deep roots in mindset. When you are in the midst of a wash, whether controlled, free, or anything in between, the key ingredient is managing your mindset by redefining results as opportunities to be enhanced and any issues as puzzles to be solved. Explore watercolor’s full potential by using a photograph’s essence as a reference to be captured, rather than copied. Each day you will work toward completing a series of remarkable scenes with Steve as your guide. More importantly, you’ll build skills at mastering a watercolor mindset that will serve you well for a lifetime of painting. This workshop will consist of demonstrations, discussions, and plenty of hands-on practice. All levels welcome. Create art in response to poetry and bind it into an accordion book. Students should have some watercolor experience and can either bring in a favorite poem or work with poetry supplied by the instructor from various contemporary poets. Students may work in watercolor or mix watercolor with other water-based media (pen and ink, watercolor pencils). The instructor will present her Poetic Dialogue Project – a series of exhibitions of artists interpreting poetry or collaborating with poets – for inspiration, as well as her own works that have been created in partnership with her poet, Lois Roma-Deeley. Individualized instruction in watercolor technique will be offered. Using Door County and Lake Michigan as inspiration, learn how to paint water that is convincing and filled with a sense of texture and movement. Adopt a three-step watercolor process for value and color studies, while learning to simplify the landscape down to its most basic shapes. Each morning will begin with a short studio demonstration addressing the challenges in painting this particular subject. Spend the rest of the day gaining hands-on practice painting water reflections, moving water, river and wave action, and color solutions. Individualized instruction will be provided throughout each day. A plein air demonstration will be included to show the process in action. "Uma Kelkar: Elegance in Watercolors"
Make your watercolors sing by studying the right balance of shapes, colors, and strokes in your scenes. This retreat features a mixture of studio and plein air painting. Enjoy the beauty of Lake Superior, healthy, locally-sourced meals, and retreat center amenities, all in peaceful surroundings in the woods and on the water. Lodging packages available. "Capture the Fundamental Essence in Watercolor"
Fabio Cembranelli will guide you in developing loose and spontaneous watercolor techniques enhancing your own personal intuitive approach. Specific attention will be devoted to the following techniques: Wet on wet, Watercolor painting on damp paper, The importance of the white of the paper and how to save or restore it, How to enhance the focal point, How to work fast, Light and shadow effects, and more. There will be daily demonstrations and critiques followed by individual attention for students. "Portable Sketching Techniques for Capturing Structures and Street Scenes"
Using Door County’s scenic towns as a backdrop, hone your skills in sketching structures and street scenes with a simple set of portable tools in this four-day workshop. Walk away with new techniques and strategies to create more interesting compositions in any setting. Through demonstrations and discussions, Ann will share techniques in using pen and ink and watercolor, zooming in on the most important elements for dynamic compositions, and achieving convincing yet simple perspective in the field. Plenty of time for one-on-one assistance will be emphasized. An enjoyable critique will close each day. Weather permitting, the class will work outside. "Exploring the Magic of Watercolor"
Immerse yourself in the unique qualities of watercolor in this comprehensive workshop designed for students looking to strengthen their skills in composition, expand their visual language, and develop their artistic voice. Create more interest in your paintings as you exploit the wonder and intrinsic beauty of watercolor with Mick as your guide. Discussions and demonstrations will emphasize the importance of developing dynamic shapes, value contrast, and edge quality to produce sound compositions. Working with a limited palette, simplifying scenes, atmospheric perspective, and color theory will also be addressed. Less experienced students will follow along in step-by-step group paintings, while more experiences painters will work from their own reference materials with Mick available for individual guidance. "Architect of Light...It's All about the Light"
The focus of this three-day watercolor workshop is on finding and expressing our own artistic voice. Fundamentals will be demonstrated and duality...the dialogue between opposing forces that finds resolution or not...on the paper's surface, will also be explored. A painting demonstration will be done first thing in the morning to illustrate the topics covered that day. There will be an informal exhibit and critique on the final day, discussing what was learned on the previous days. "Watercolor: The Perfect Plein Air Medium"
Learning to paint on location is not only fun, it can help you to make strides in your studio work as well. Bring excitement to your paintings with the use of strong value sketches, bold washes, and quick energetic strokes in this two-day workshop. Each day will begin with a meeting in the studio to discuss the day’s plan and key concepts with time split between painting indoors and out. Brienne will demonstrate and explain her process for plein air painting, including where to start, what to paint, and how to deal with the elements, as well as share great exercises and practices that will help you become a better painter in and out of the studio. "Freedom in Watermedia with Stan Kurth"
The Freedom in Watermedia Workshop is designed to teach all levels of students to paint intuitively, starting without preconceived notions or outcome. There is no preliminary planning or drawing. The process will dictate direction as students use a variety of techniques to implement color, texture, line, shape and value. Instruction will start with arbitrary mark making and color application, working transparent to opaque building layers using a variety of mark making tools, watercolor, gesso and acrylic. It is entirely possible finished work may be representational, but the goal is work which is visually pleasing and aligned with the artist's personal aesthetic. 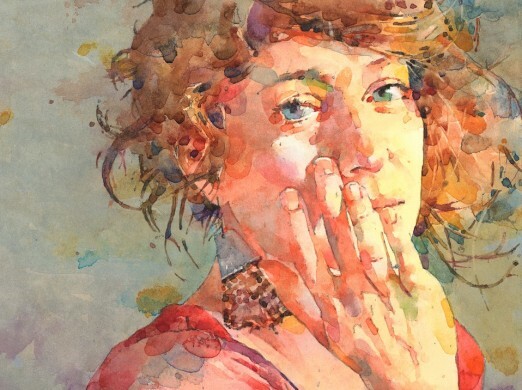 "Janet Rogers: Watercolor Impressions: From Flowers to Figures"
Develop a loose and natural approach to painting flowers, faces, and figures with nationally recognized artist Janet Rogers. All levels of painter welcome. Enjoy the beauty of Lake Superior, healthy, locally-sourced meals and retreat amenities, all in peaceful surroundings in the woods and on the water. Lodging packages available.